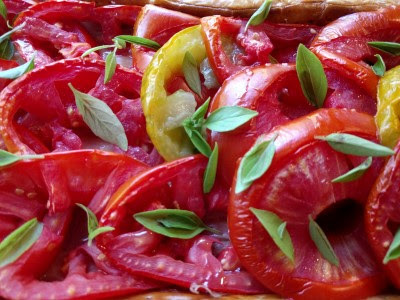 Several years ago, we made the Tomato-Mozzarella Tart from America's Test Kitchen. The recipe is in Baking Illustrated and in The Science of Good Cooking. At the time, I wasn't super impressed by it. 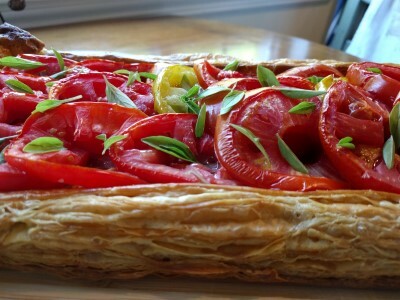 That was surprising because it's from ATK and because it's some of my favorite foods: puff pastry, tomatoes, cheese, basil. 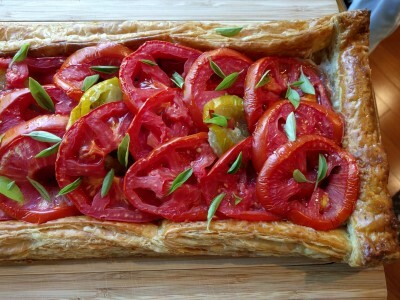 At the time, I much preferred the Roasted Tomato Tart we make with roasted tomatoes and feta or goat cheese. 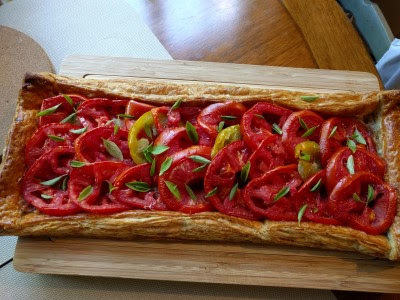 The ATK tomato tart so unimpressed me that it has been years since we made it - the last time we made it was before the blog since I cannot even find the recipe on the blog. But I decided I wanted something different from our usual, so we decided to give it another try. This time, we added the prosciutto. It's also possible that the one & only time we made it, we didn't use fresh basil. This time, we used some of our dwarf basil. The puff pastry also got much puffier and flakier than last time. So many golden, flaky layers topped with parmesan, mozzarella, prosciutto, and farmers market tomatoes plus one yellow tomato from our garden. I don't know what we did last time to make it not so tasty because this time, it was delicious. Oh my gosh. I think I now like this tart better than the Roasted Tomato Tart. Salty prosciutto, melty mozzarella, flaky puff pastry, fresh basil - all the flavors of summer on the "last" weekend of summer (Labor Day weekend). 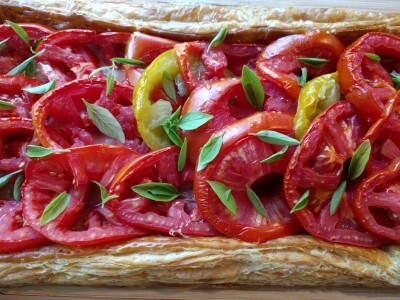 We need to make this again, very soon, because I'm not sure I can wait until next summer season for the fresh basil and local tomatoes for this tart. *We omitted the garlic and added prosciutto on top the cheese/under the tomato.